The Vietnam-Singapore Industrial Park (VSIP) Company in the central province of Nghe An started construction on a wastewater treatment plant with a daily capacity of 28,000 cu.m on August 2. The first phase, with a capacity of 6,000 cu.m per day, will be completed in August 2017. 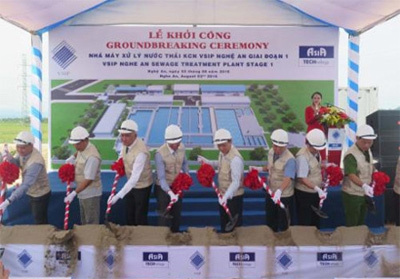 Once fully operational, the plant is capable of treating wastewater for the whole 750 hectares of VSIP Nghe An. Addressing the event, the company’s Deputy Director General Edwin Chee attached significance to the construction, saying that it not only reflects VSIP’s commitment to creating a clean environment but also contributes to attracting more investment in the industrial park. Previously in July 2016, the company also started construction on a 5,000 sq.m workshop, which is expected to become operational in the fourth quarter of this year. 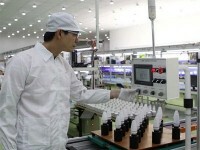 Established in 1996, the VSIP Group has developed seven industrial parks in Binh Duong, Bac Ninh, Hai Phong, Quang Ngai, Hai Duong and Nghe An provinces, with a combined area of 6,100 hectares. VSIPs have so far attracted 616 investors with a total registered capital of USD 8.5 billion, creating jobs for 160,000 labourers./.